Guess what? You’re a Mammal! Are you ready to admit you’re an animal? 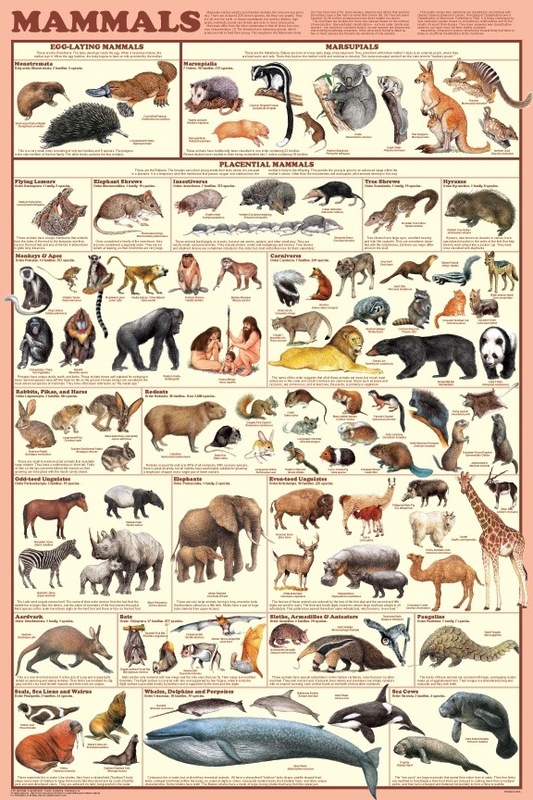 A mammal like a chimpanzee, a dolphin, a giraffe, an elephant or a cat? We have become so civilised and socialised that we go through the day forgetting we are mammals. Birth is a great leveller, because labour asks us to let go of self-consciousness and tap into our inner mammal. I was confronted, horrified and mortified by the birth video shown in the antenatal classes at our local hospital. I don’t know why this video was considered appropriate to show a group of nervous and inexperienced adults who had never seen a real birth before – only dramas on TV. The only birth that looked like something I could handle was the one where the woman had an epidural and I had already decided I didn’t want to have a needle in my spine or risk the effects of an epidural on my labour. Even the birth described as a ‘nice, gentle water birth’ was way too much for me. Labouring women looked sweaty and messy, their bodies were heaving, their sounds were animalistic and almost sexual. I felt like I was prying on some very private moment that I wasn’t meant to see. I certainly didn’t like the idea of behaving like this myself! It was terrifying to think of losing control like that in front of other people (this should have been a clue that I needed privacy!). No matter how much I prepared for my first birth with reading and learning, I was still uncomfortable with the raw, animalistic nature of birth and I couldn’t imagine myself in this state. I needed to feel completely safe and unembarrassed before I could really immerse myself in labour. During my second birth I was able to trust, relax and let go completely. The experience was powerful and pain free for me and a straightforward, safe and much faster birth for my son. I didn’t need to rehearse or learn how to give birth. It was instinctive. This is how it is for other mammals – most of the time. And this is how it may be for humans – most – but sadly not all of the time. If you want your baby’s birth to be natural, normal and safe, then it is wise to understand and accept the nature of birth. 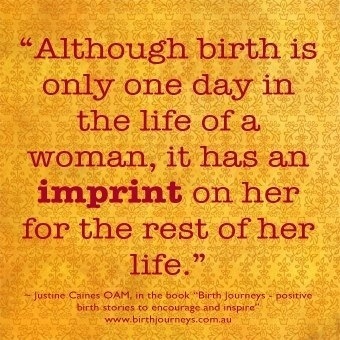 Birth is raw, physical, animalistic and instinctive. Your mammalian body does know what to do but it needs the right conditions. You need to make sure your human self-consciousness doesn’t get in the way. To birth your baby, you need to feel safe enough and comfortable enough to let yourself move instinctively, to feel able to tear off your clothes, to moan and groan, to be loud, or to be inward, withdrawn and private, and to do whatever feels right for you. The hormones that drive labour have evolved to work when you feel safe, unobserved and willing to give yourself over to birth. The bottom line is you need to feel comfortable with being a mammal! If you are uncomfortable watching a DVD of a woman in labour then don’t avoid them. Watch a whole lot more, but do choose your viewing wisely. Gentle natural births that show women moving around, making labour sounds, or entering into deep states of relaxation, and being supported and nurtured by carers and partners can give you a positive and realistic image of what labour can be like. Water births are probably the least confronting to begin with. Animal births may be a good way to ease yourself into watching births too. In contrast, viewing frightening, stressful births and emergency scenarios do more harm to you than good. Don’t imagine that reality birth shows will help you prepare for an emergency, just in case one happens. The only thing that will help you in an emergency is knowing that you can trust your carers and that you will be treated with love and respect as well as medical expertise. Focus on ensuring you have that relationship of trust, respect and nurturing with your carers and supporters instead. This will serve you well, no matter how your baby is born. 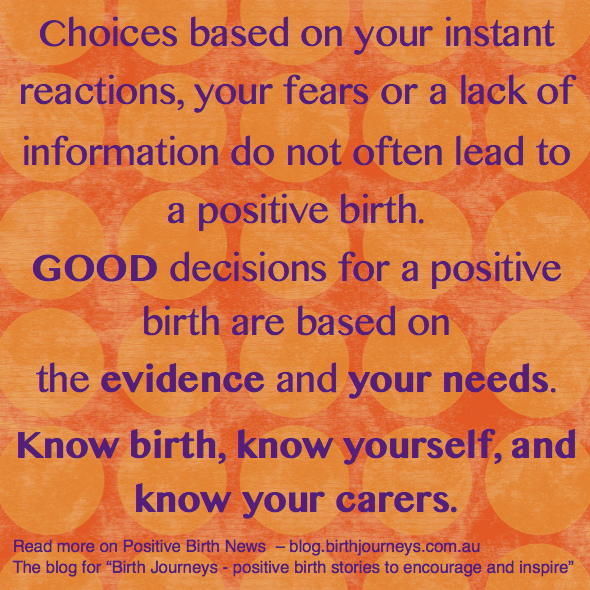 Categories: Birth Information, Birth preparation, Opinion | Tags: birth, hormones, instinctive birth, labour videos, mammalian birth, natural birth, Positive birth | Permalink. Why would women have a doula when their partner will be there to support them? Men attending their baby’s birth is a relatively modern phenomenon. My father was not present at either my birth or my brother’s birth and in the 1970s this was the norm in Australia. Fathers are now expected to be present and to shoulder a large part of the birth support role. Now many men want to be there. They want to support their woman and they want to see their child into the world. But how prepared are today’s men for this new role when their own fathers were at work or down at the pub when they were born? Consider that first time partners have (most likely) never seen a birth. If it is your first birth, then the chances are you haven’t either. Your partner (most likely) hasn’t read positive birth stories, watched gentle birth DVDs and has consumed less information than you. They have (most likely) been told sensationalised and frightening birth stories including stories from men about seeing their partner in pain, seeing blood, poo, vomit, fluids and very intense and stressful situations. Your partner is also carrying the legacy of their own birth story and they have (most likely) not reflected on their entrance to the world and what this has taught them about birth. They may be frightened – but they’re probably not about to let you know because they want to be a rock for you. Your partner may not have gone through the same journey of learning and transformation as you in preparation for this birth and the transition into parenthood. If this is not your first birth, then your partner may be distressed by the memory of your last birth. Even a straightforward and uncomplicated birth may have been a shock. They will have had less opportunity and less support than you to debrief and integrate their experience. Men don’t get to meet up with other men post-birth and swap experiences the way women do. Men don’t usually get to go to birth circles or have heart to heart discussions about their experiences and feelings. They don’t get to do prenatal yoga and meditation where they can bond with their baby and visualise the birth they want and how they want to feel. They will have had less opportunity to do the healing and growing needed to go into another birth feeling ready, open and strong. Your partner has a huge emotional investment in this birth. It must feel like the lives of the two most precious people in the world are in a boat out at sea and your partner is waiting, hoping, and willing that they will see both you and your baby safe in the harbour at the end of birth. A doula won’t take away from your partner’s role, nor destroy the intimacy of experiencing this rite of passage as a couple. 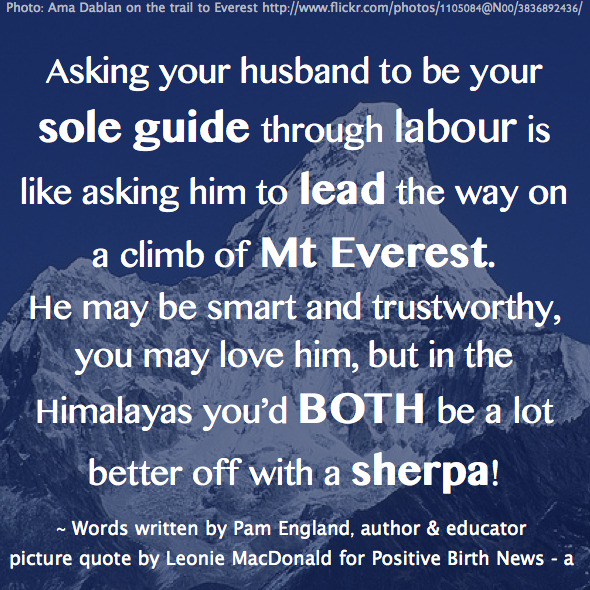 However a doula can support and reassure your partner so he can support you throughout the birth. Your partner deserves this support as much as you do! Some ideas and resources to help your partner feel positive, supported and ready for birth too! Beer and Bubs is a childbirth class for men held in an informal, friendly pub environment. Men have the chance to talk with a father who has done Beer and Bubs before and since experienced the birth of their baby, as well as learn from childbirth educators. Available around Australia. Cheers to Childbirth is the book that grew out of the Beer and Bubs program, written by Lucy Perry with birth stories from celebrity dads. Birth Journeys – positive birth stories to encourage and inspire contains three stories which share men’s experiences of birth (so do pass these stories over to your partner if you have the book!). These are Lachlan and Bree’s story of their first birth, Christian’s story of his second daughter’s birth in the water (she was born in the caul! ), and Chris tells the story of his second baby’s home birth. There is also a piece by David Vernon on how men can prepare themselves to support their partner during labour. Categories: Birth Information, Birth preparation, Opinion | Permalink. We just had our first visit to the hospital antenatal clinic and we were so excited to receive a bag filled with brochures, discount vouchers, guides to pregnancy and labour, and advice about all the products we should have now that we were about to become a family of three. Now we had this list to tell us what we needed. We would be alright. But there was a problem. This list was enormous. Apparently our baby was going to need an incredible number of things to survive and thrive! Not just milk, nappies, clothes and a place to sleep. Nappy wipe containers with heaters, special wedges to keep him from rolling over in bed, nappy dispensers and special nappy bins, disposable nappy bags, a portable change mat and nappy change bag, a change mat cover for a change mat to go on a change table, a bouncer, a rocker that played music and had pretty light, mobiles that spun around and played music, play mats, bottles, special teats and formula just in case we couldn’t breastfeed, a steriliser for cleaning the bottles, a bassinet, a cot, a cot mattress and linen, dummies, blankies, lovies and onesies…what were we getting ourselves into? This was going to cost thousands. Already my stress levels were rising. How could I be a good enough mother when I’d already failed the first step? I couldn’t afford all these things on The List. So we did something radical! Instead of starting with everything we decided to buy the minimum and see how we went. We bought a beautiful convertible cot, we were given a pram, we bought modern cloth nappies, some beautiful linen for the cot and the basic clothes (singlets) the rest we were given as gifts. And we had the all important car capsule on hire. My big luxury was a rocking chair – a beautiful cane rocking chair that I just had to have. We had no change mat, no change mat cover, no bassinet, no dummies, no blankies or lovies, no steriliser, no bouncer, rocker, nappy wipe warmers or any of those extras. Most of the items on the list got a firm line through them. And, it actually worked out fine. Our baby didn’t want to sleep in his cot much. He preferred to sleep on my chest. And it turned out I don’t like rocking chairs. But apart from that we didn’t waste much money! After our son’s birth we bought a baby bath, a change mat and a modern take on the old fashioned very simple bouncer. As we got to know our baby we experienced how useful these would be and we were able to buy the items that suited our needs and our baby. And perhaps because we didn’t have everything on the list we had to rely on ourselves to soothe our baby instead of using devices. We felt the joy and exhaustion of dancing around the lounge room (we got to practise our ballroom dancing at the same time and now my husband does a great foxtrot with a tiny baby in his arms). We learnt new songs and remembered old lullabies to hum or sing to our baby as his head was snuggled over our shoulders or beneath daddy’s neck. We bought good baby carriers as we learnt that our baby wanted to be held in our arms and the pram became a shopping trolley. We learnt that in truth, what babies and new parents need most is left off The List. Support – yes, you need and deserve support. Don’t try to do this all by yourselves. You – your baby needs to be in your arms, on your chest, and preferably at your breast. Your baby needs to be held close by you. At first this is a very physical closeness and babies want to be held by you as much as possible. Later as your baby grows up this is an emotional and mental holding close as you keep in tune with how your child is experiencing the world and provide stability, love and reassurance. And forever it is holding your baby in your heart – no matter how old they are now! There are many practical things you will need and want to help you care for your baby. These are the simplest and most important ones on my list. Breastfeeding – bamboo breast pads, nursing bras and a good breastfeeding pillow. Some breastfeeding tops or stretchy T shirts and long tummy covering singlets to wear underneath. The phone number of your local ABA group and the breastfeeding hotline. Better yet, go along to meetings and make contact with your ABA group in your last months of pregnancy. If you need support after birth these women will be there for you! Nappies – of your choice. Cloth nappies are amazing these days and all in one pocket nappies are my first choice. There’s nothing wrong with buying a mix of disposable and cloth nappies to see you through the early days if you’re not sure about washing all those cloth nappies and their inserts. If you decide to use disposable nappies think about those with the least environmental impact if possible. But the highest priority for me was nappies that worked, nappies that didn’t break (no more bandaids to fasten a broken disposable please!!) and nappies that were comfortable for my baby. You may like to learn about elimination communication too. I have friends who have great success with this approach to toileting and baby care. Wipes – bamboo velour cloth wipes, disposable wipes – I quite liked Gaia and other eco brands. Change mat – buy a nice comfy one with good high sides to help keep your baby from rolling. Don’t go for seatbelts though! Get soft and easy care covers and make sure either cover or mat has a water resistant layer for little change time accidents. Change table – (yes we got one second time around!) yes they are very useful. You can judge whether you need one or not. Baby wraps – nice soft really big ones. Don’t bother with ones less than 1m square as they won’t last long. Baby cocoon wraps look quite good too for keeping your baby snug and secure feeling. But both my babies hated being wrapped from quite early on and I didn’t wrap for many months. Lotions and Potions – tea tree oil to make up a weak antibacterial wash for wiping your baby’s bottom if needed. Olive oil for their skin. There are many beautiful products for looking after baby’s skin. Look for simple ingredient lists and be aware that your baby’s skin can react to the same products that another baby’s skin loves. Take it slow. One baby sling or carrier – a stretchy or woven wrap like a Moby wrap, Hug a Bub or any of the many beautiful woven wraps is my first choice after two quite different babies. You can buy different kinds of slings and carried nce you know what suits you, your baby and your lifestyle. You don’t really know until your baby is here. Please don’t buy a carrier that pins your baby to your body with their legs dangling straight down. Do look for carriers that an older baby almost sits into (such as the ergo carrier) as this is much better for their body. Categories: Baby Care, Opinion | Tags: Baby, baby care, baby items list, baby products, Shopping, what baby needs | Permalink. Birth is Not Therapy is a wise piece by Chloe Bayfield and every woman contemplating a VBAC or any birth after a previously hurtful, disappointing or traumatic birth should read her story. Chloe is absolutely correct. We should not expect a particular birth, like a natural birth, a drug-free birth, or an ecstatic pain-free joyous birth to be the answer or to heal our hurts and make us whole. My second birth was joyful, pain-free, empowering and inspiring! I did feel like a goddess! Yet it doesn’t erase the impact of my first birth. Birth can truly be wonderful, empowering and awe inspiring – but only a woman can do her healing for herself. It is her own emotional work, her own reflection and learning, her own story to process and integrate… and it can be like peeling back layers of an onion. Each time I revisit my first birth story, I discover more – more grief, more tears, a little more anger, and more lessons for me. Strangely, I now also find inspiration and a greater understanding of myself. And this somehow makes meaning out of a birth that while not outwardly traumatic – left its mark on me. It is each woman’s journey that changes her and makes her feel strong, wise and whole again and this journey goes well beyond birth. Categories: Links, Opinion | Permalink.